A Rinkya Blog: Transformers 2 Movie- SoundWave Is In! The transformer Soundwave is confirmed for Transformers 2. 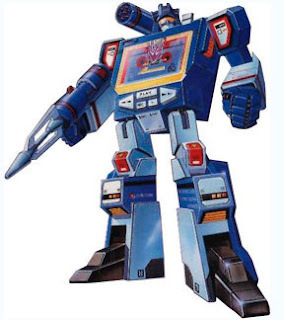 Soundwave is a Decepticon tape player, he ejected tapes which also turned into miniature robots, jammed radio signals, and could read minds. He is definitely one of the more popular Transformers and is sure to make many fans happy with his entrance in the movie. Transformers on the Blog, Including Links for Exclusive Items! I finally got around to watching Tranformers: Rise of the Fallen and I have to say their (Michael Bay's) version of Soundwave was a mockery of the tape player that we've all come to know.